How is that two people can respond to the same situation in very different ways? When the game is on the line, one athlete folds under the pressure and retreats; the other embraces the challenge, rising to the occasion. When “life” gets in the way, causing a disruption to their fitness and nutrition plan, one client allows a small misstep to domino into a colossal meltdown; the other calmly evaluates the situation and gets back on track as soon as possible. It’s easy to write differences in response like this off to personality or simply a matter of self-discipline. And that’s exactly what most coaches and trainers do. Pretty common response. But this line of thinking is also massively destructive to your effectiveness as a coach and to the results/success of those you work with. Because doing that overlooks one of the biggest factors at play, and it’s something completely within our control. After more than a decade of helping the world’s top performers make their best better, there’s one infallible truth I’ve seen play out over and over again: you have to be in control of your mindset before you can control your performance. “Mindset” is simply one’s perspective. It’s how you see yourself, your situation, and the world. When faced with challenges, one’s mindset will determine how they respond. If you are not able to coach the mental side of performance by providing clients and athletes with tools, strategies, and practices to develop resilience, confidence, and focus, you are failing to address a crucial piece of the performance puzzle. Mindset is one of the most important yet overlooked aspects of performance. For athletes, it’s the difference between reaching their peak potential or cracking under pressure when it matters most. And for people looking to improve health and fitness, it’s the difference between getting decent results in the short-term (only to give up), and those who experience lifelong transformation. This can’t be overstated: it’s your ability to coach and develop an elite mindset that will allow you to become the best coach you can be. The good news? Mindset is something we can learn to change and improve. And learning to coach the mental side of performance is a skill set you can develop. These are real struggles that coaches face every single day. But what if there was a different way to respond to these challenges? What if, instead of throwing your hands up in frustration, you had a tactical, intentional plan for improvement so that this didn’t happen in the future? What if you could teach that athlete to stay calm under pressure, embrace the pressure as a challenge, and still perform their best? And what if you help that client develop strategies to redirect their focus when challenges arise and make the next best decision to reach their goals? It’s not just possible; with the right tools, it’s probable. I see it every day with the coaches and athletes I work with. And until you’re willing to dedicate just as much time to learning and coaching the mental side of performance as you do to writing better fitness programs or mastering the X’s and O’s, your success — and the success of those who call you coach — will be limited. Contrary to popular belief, mindset isn’t all rah-rah, “just think positive thoughts!” and read-this-motivational-quote mumbo jumbo. Mental performance is just like any other aspect of health, fitness, or performance; a skill that is developed over time with consistent, intentional practice. Teaching all of the skills and strategies needed to cultivate an elite mindset in one article would be impossible and incredibly overwhelming (just like if you tried to learn everything about fat loss, conditioning, or strength in one sitting). that you can build off of. When it comes to mental performance training, the first thing you have to understand is that mindset is dynamic — it can change and grow. I know it seems simple — almost too simple — but this little truth has HUGE implications. Just like you can help a client get stronger or an athlete improve their skill in a specific area, you can train those you work with to have a more tactful, resilient, focused mindset. Social psychologist Carol Dweck is credited with coining the terms “fixed” and “growth” mindset. Fixed [average]: My intelligence/talent/ability is the way it is — and there’s nothing I can really do about it. People with a fixed mindset also tend to believe that talent alone creates success — without effort. Growth [elite]: My intelligence/talent/ability can be developed through dedication and hard work — brains and talent are just the starting point. This view creates a love of learning and a resilience that is essential for great accomplishment. 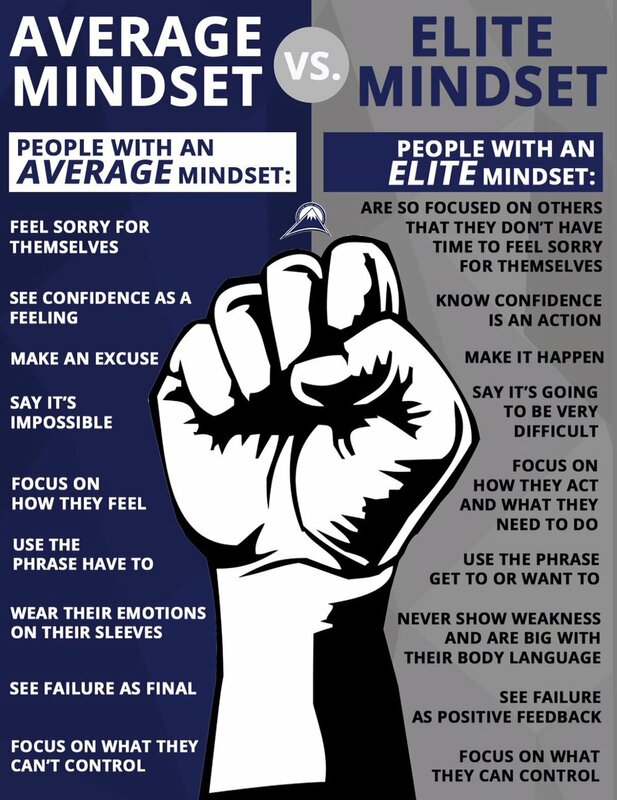 It doesn’t take a rocket scientist to figure out which of these two mindsets will lead to the greatest level of success, does it? Of course not. Common sense suggests, and studies of the world’s most successful people confirm, that having a growth mindset is absolutely crucial for success and is the foundation that every other aspect of mental performance rests on. As a coach and trainer, you want to be able to train a growth mindset in your clients so that they can better withstand the struggle that they will be faced with when in the pursuit of excellence. How can you start doing that? That’s what we’re going to cover next. Whether you’re a trainer helping people improve their health and fitness or a coach trying to get your team to the championship, the starting point is largely the same: figure out where you’re at now, and then start training areas of weakness so you can get closer to where you want to be. When it comes to mental performance, the same structure applies. In order to help those you’re working with gain the peak mental performance they need to become the best they can be, you have to first know what you’re working with now. So in the same way that you perform an initial assessment of a client’s strength or put your athletes through drills to assess skill level in various areas, you can also assess mindset. The best way to do this is to include a simple questionnaire during your initial assessment with each person you work with to see if they have more of a growth or fixed mindset (or, if you’re coaching athletes in a team setting, find a way to integrate this into practice). Having a growth mindset is like the raw materials (belief that you can learn and improve) needed to make significant, long-term progress, even when it’s hard. By knowing whether or not those you’re working with have a growth or fixed mindset from the get-go, you’ll be able to develop a mental performance training strategy before challenging situations arise, making it much more like that a) they’ll successfully reach their goals, and b) clients will stick with you long term and tell everyone they know about how great of a coach you are. Note: There are various fixed vs. growth tests/quizzes online that you can use, or you could develop a basic assessment on your own. This doesn’t have to be overly complicated. Simply look at the fixed vs. growth mindset graphic earlier in this article and develop a few questions that will give you a good idea which side someone favors. Integrating some type of mindset assessment into your coaching is step #1, and it’s something every coach and trainer should be doing. But that’s not where this ends. After the assessment is where the real work comes in, especially if you’re dealing with someone who leans heavily toward a fixed mindset. It’s your job as their coach to train your clients to develop a growth mindset. This means holding them responsible for the energy, attitude, and mindset that they bring on a daily basis. Getting into the nitty-gritty of cultivating an elite mindset is an article all by itself (and something I will cover in more detail in the near future), but for today, I want to outline the number one thing you should do to help develop a growth mindset and highlight the biggest mistake I see coaches make. One of the best ways you can begin training a growth mindset with your clients is through how you provide praise and how you coach them through setbacks. When providing praise and feedback related to performance, you do NOT want to focus on ability in a “you either have it or you don’t” kind of way. You DO want to focus on the effort they put in and how much they have learned and developed through the work they have invested. Same goes for coaching your clients through setbacks. It may seem small, but this is a simple way that even the busiest of coaches can use to begin to working mental performance training into their coaching. That’s it? Hardly. But it is a great place to start, especially if you’re not doing anything to address mental performance currently. Make an effort to integrate the mindset assessment outlined above with your clients and athletes, and then make a consistent effort to address their specific sticking points by moving them from a fixed to a growth mindset. Having a growth mindset (the belief that you are in control of your own ability, and can learn and improve) is the key to success academically and athletically as well as in business and in life. Cultivating a growth mindset in those we work with is crucial for their long-term success and is an important part of your effectiveness as a coach. When it comes to health, fitness, and performance, most coaches and trainers think of the physical side of things. There’s plenty of resources out there that will teach you how to better coach the fundamentals or get clients and athletes stronger, leaner, and more conditioned. And while that’s obviously a huge part of the performance puzzle, being able to identify your clients’ and athletes’ mindset and intentionally train them to develop the resilience, optimism, and awareness they need to focus on what matters is key for getting long-term results. As the fitness and performance profession becomes more saturated, as sports become more competitive, great coaches — those who become known as the go-to “experts” in the industry and build teams that win — will separate themselves by learning how to coach mental AND physical performance. That’s why I’m excited to announce that I will be releasing the first ever Peak Mental Performance Certification this December 2018. In the course, you will learn the skills, strategies, and tactics you need to train an elite mindset, build a winning culture, and help your clients or athletes develop the mental skills they need to reach their peak potential and consistently achieve long-term success. To learn more about this complete self-study system, join the free Insider’s List below. I will only be opening up registration for a limited time and spots are first come, first served.